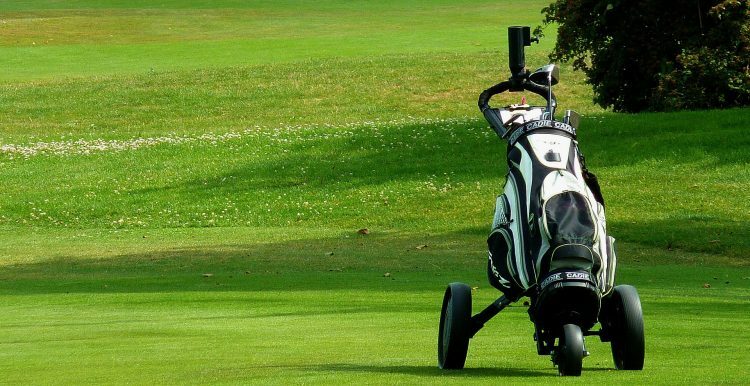 Golf is intimidating for any beginning golfer. While the countless swing tips you’re getting from your instructor are tough enough, the verbiage and lingo only add to the confusion. There are literally hundreds of terms that make little or no sense whatsoever. What does a birdie have to do with golf? A slice? Are we talking about a piece of bread? Fortunately, we’ve got your back and have compiled a comprehensive list of golf terms with definitions. 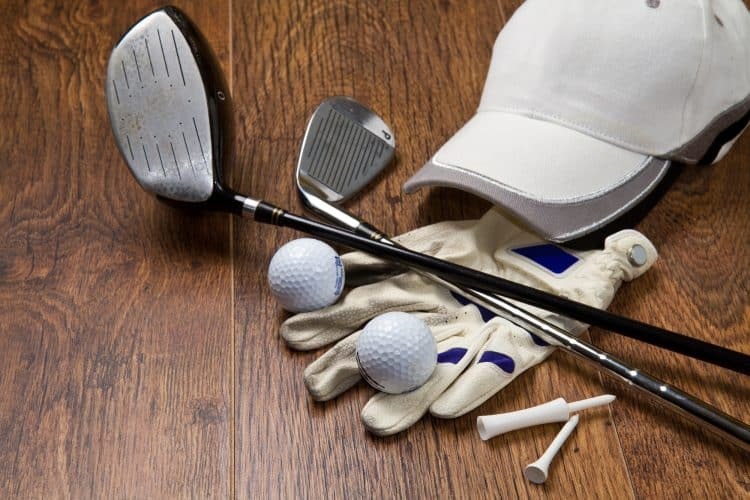 We have compiled the ultimate list of golf terms, phrases, sayings, lingo, and terminology in order to help you understand all the little nuances to the game of golf. Hitting the ball into the hole on your first shot from the tee. 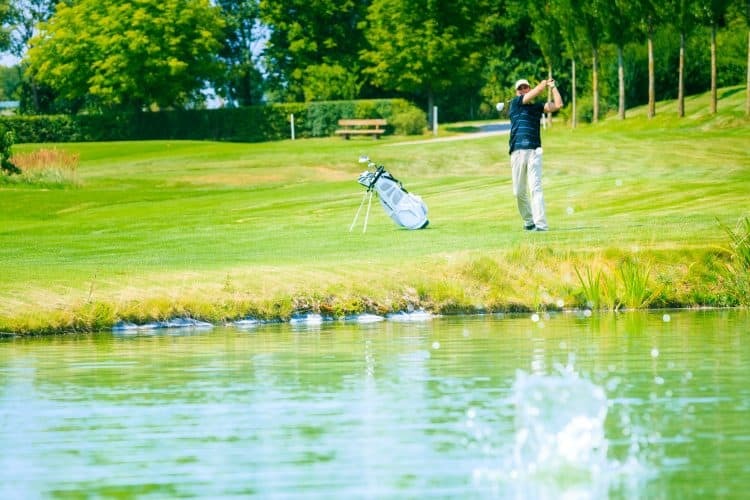 Making a score of three under par on one hole; for example, either a one on a par four or a two on a par five; also referred to as a double eagle. Reference to a match that is tied during match play format. The last long shot onto the green; often your second shot on a par four or third shot on a par five. The short cut of grass immediately off the edge of the green. When your ball is farthest from the hole and it is your turn to hit. The longest set of tees you can play; commonly referred to as the “tips”. A small, flat object placed directly behind your ball on the green; pocket change or customized plastic spheres are common ball markers. A grip where all 10 fingers are on the club; there is no interlocking or overlapping of fingers. 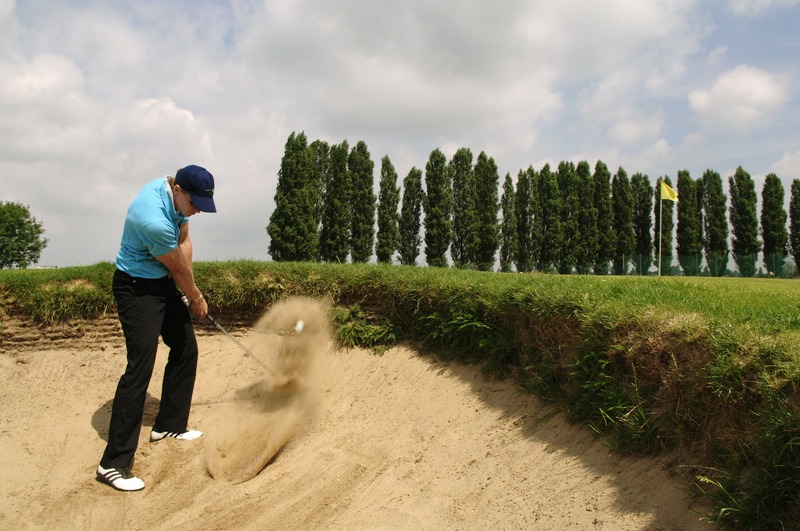 A reference to a bunker, sand trap, or waste area; a hazard containing sand. A best-ball format is a game for foursomes when players are split into two-member teams. The lowest score of each team is counted on each hole. For example, if player A makes five and player B makes four, the score of four is recorded for the team on that hole. This game is often played in a match play format. A score one below par on any hole; for example, two on a par three, three on a par four, or four on a par five. A shot with a lot of backspin that stops quickly; players will often tell their ball to “bite” if they think they have hit it too far. A shot hit off the bottom of the of the club that comes out low and travels too far. A shot that starts to the right and stays right for the right-handed player, or a shot that starts to the left and stays left for the left-handed player. A score of one over par on any hole; for example, four on a par three, five on a par four, or six on a par five. A hazard found close to the fairway or green that is filled with sand. A shot played in close proximity to the green from either the rough or apron; chip shots are usually played with a lofted club. Any shot where a player hits the turf before the golf ball; also referred to a heavy shot. 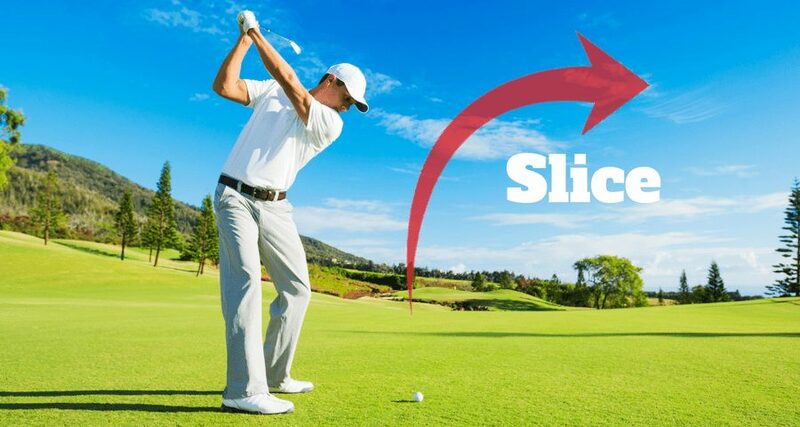 A common ailment of golfers where the swing path moves from the outside to the inside, producing a slice shot. 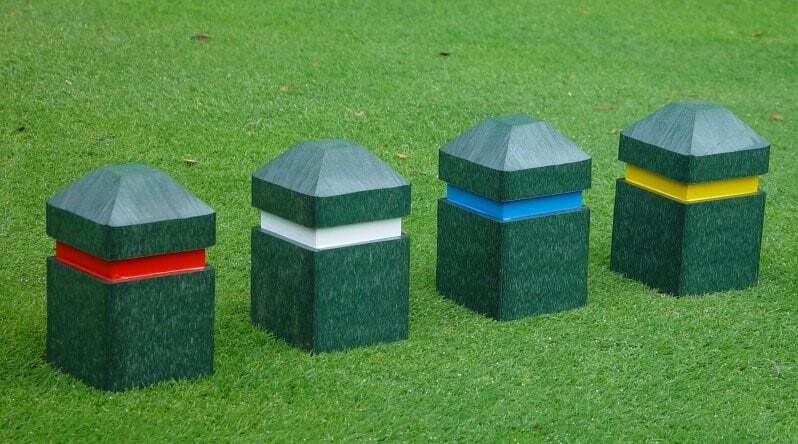 Also referred to as the hole, a cup is the plastic and metal fitting that is dug into the green where your ball ends up when you finish a hole. The chunk of turf that is displaced after a shot. Any hole that curves or bends to the right or the left. A score of two above par on any hole; for example, five on a par three, six on a par four, or seven on a par five. A shot where a player aims one direction, expecting the ball to curve back to the target, but it curves the opposite direction; for example, a player aims left but the ball curves left instead of right, and vice versa. A shot that curves gently from right-to-left for a right-handed player, and left-to-right for a left-handed player. 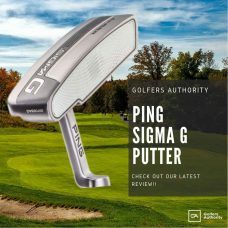 The longest club in the bag with the largest head; used to tee off on long par fours and par fives. A shot that violently curves to the left for right handed golfers, or violently to the right for a left-handed player. A widely used term for any shot that is mishit. A score of two below par on any hole; for example, one on a par three, two on a par four, or three on a par five. A term that refers to the conduct expected of golfers. 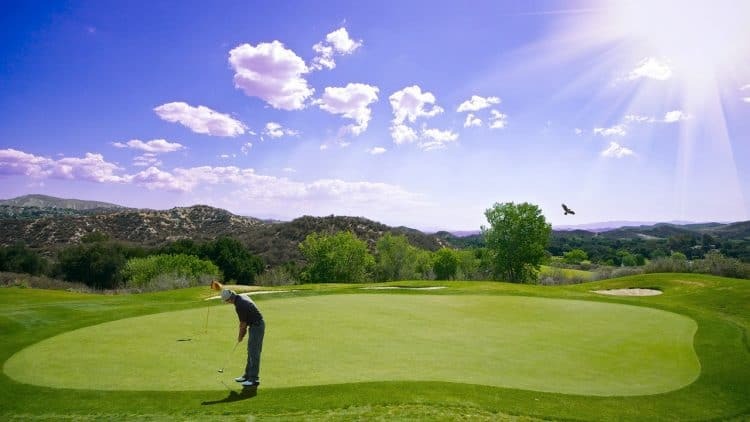 A course that is shorter in length and typically has a total par that is less than a regulation course; executive courses typically consist of only par threes and par fours. A shot that curves gently from left-to-right for a right-handed player, and right-to-left for a left-handed player. The short cut of grass that begins after the tee box and ends short of the green. A term used to describe any shot where the club hits the turf before the golf ball. The tee box on the first hole where you begin your round. A high shot played close to the green, where the ball is elevated and lands softly. 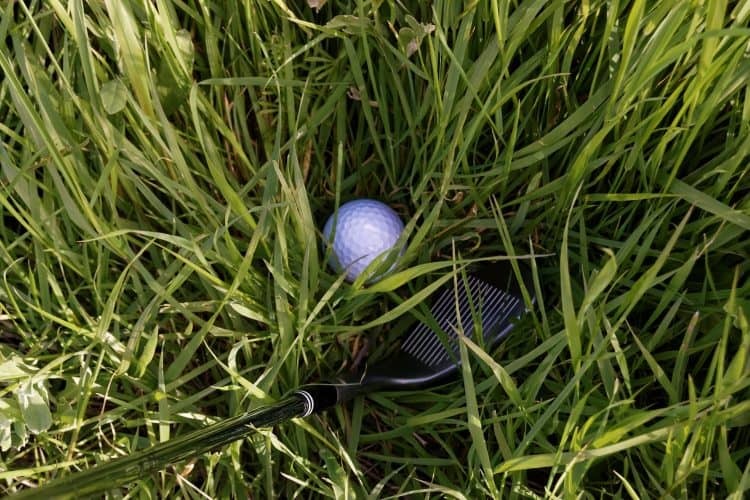 A shot played from the rough where grass is caught between the clubface and the ball reducing spin, causing it to travel farther. A term that is yelled for wayward shots that are headed in the direction of other players. The shortest tees commonly played by ladies, seniors, and juniors. 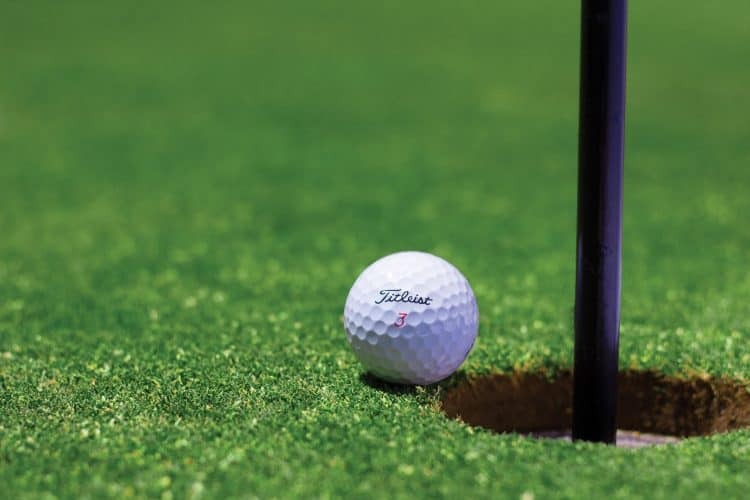 A shot that lands in a bunker and stays in its pitch mark; the lie looks like a fried egg. The first cut of grass off the green, shorter than the apron. A term used by players when they think a shot will come up short. A shot that ends so close to the hole that you’re playing partners allow you to pick it up instead of putting it out. A term that refers to the ball closest to the hole; also referred to as a “KP”. The fee that players pay to the course to play either 18 or 9 holes. Reaching the green in one shot on a par three, two shots on a par four, or three shots on a par five. Touching the ground with your club prior to your shot. A measure of a player’s ability that accounts for her most recent scores and the difficulty of the courses she plays. 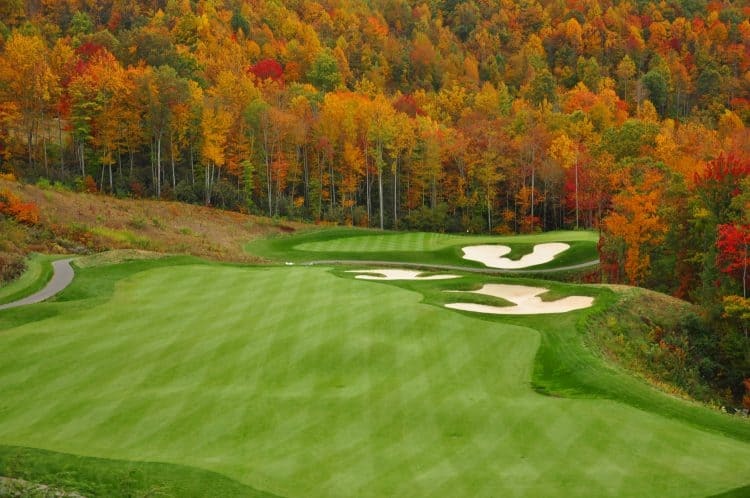 Players have “honors” if they made the low score on the previous hole and get to tee off first on the following hole. A shot that curves too far left for the right-handed player, and too far right for a left-handed player. 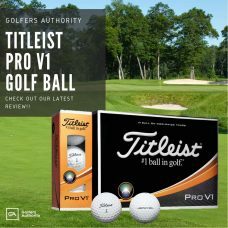 A player is “hot” if he makes consecutive low scores or is on a favorable streak; a “hot” golf ball travels beyond the intended target. 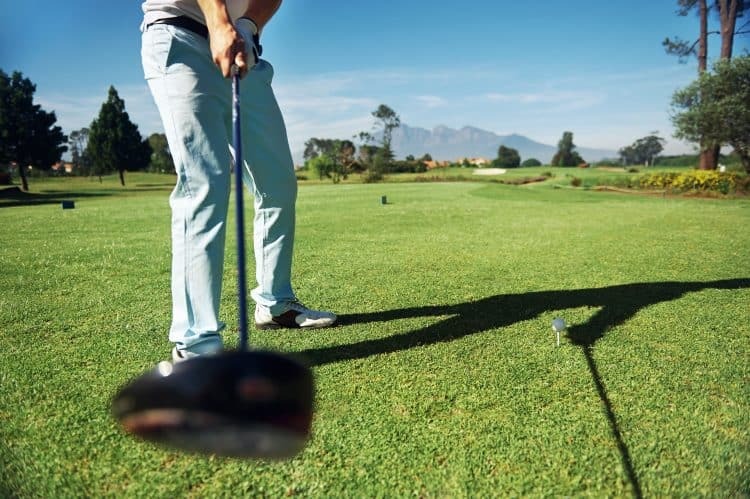 References the position where the golf ball comes to rest; balls in the fairway tend to be “good” lies and balls in deep rough or trouble are “bad” lies. When a shot touches a large part of the hole but does not go in. A scoring format where the number of holes a player has won is tallied instead of her total strokes for a round; if a player is up by two holes over her opponent, then she is “two up”. A term used for a shot that is played again because the original shot was not desirable; mulligans are illegal in competition. A restaurant, snack shack, or bar where players gather after their round. A course boundary marked by white stakes; if a player hits a shot out of bounds, she must replay the shot and incur a one-shot penalty. The number of shots a player is expected to score on each hole. The long stick with a flag that is put in the hole to mark its location. 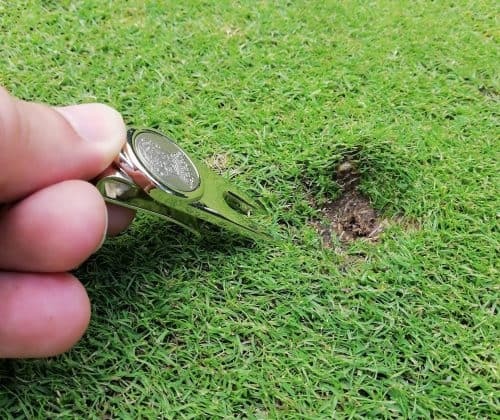 An indentation your ball makes when it hits the greens from a long distance; also referred to as a “ball mark”. A shot played from near the green, but longer than a chip. Playing the ball down is playing it as it lies. Playing the ball up allows players to move their ball to a favorable lie. 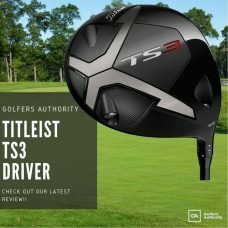 Playing the longest tees on every hole; recommended for only highly skilled golfers. When a slow group of players lets a faster group of players pass them. A betting term that refers to a new bet during a match, where the original bet still stands; essentially a double or nothing bet. A second ball that is played from the same spot if a player thinks his ball may be lost or out of bounds. A shot that starts left of target and stays there for the right-handed player, and vice-versa for the left-handed player. A two or three wheel apparatus with a handle that supports a player’s bag and is pulled along during a round. Penetrating large holes in the green to improve growing and drainage conditions; also referred to as “aerification,” this usually happens in the spring and fall. Any shot struck with a putter on the green. An electronic device used to measure the distance to a pin or other obstacle on the course. 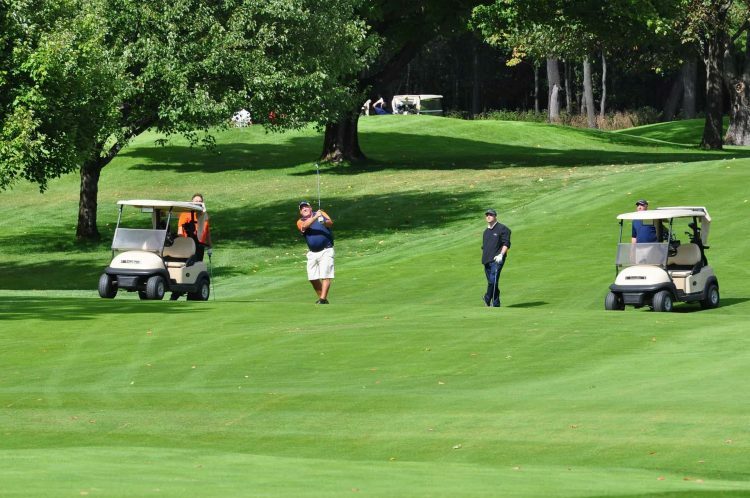 An employee of the golf course charged with monitoring pace of play and course rules. Playing in an order of whoever is ready to hit instead of who is farthest from the hole. The longest cut of grass on the course surrounding fairways and greens. A term for players that purposely inflate their handicap to gain an advantage over their competitors. A format in which teams of two, three, or four players each hit a shot and choose the best one; from there the process is repeated until the ball is holed. A word that refers to a shot struck off the toe or heel that travels sideways; also called a “lateral”. When a player misses a green on the side nearest the flag leaving little green between the player and the hole. Term golfers will use when they think a shot is going to travel too far; synonyms include “get down,” “grow teeth,” and “come down”. A shot that is struck off the bottom of the club, comes out low and travels too far. 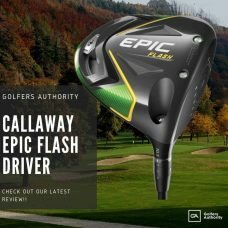 A shot that curves uncontrollably to the right for a right handed golfers, and to the left for a left-handed player. 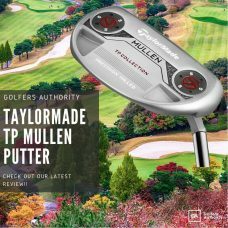 A reference to a tee shot that is hit long and straight. A score of eight on any hole. A term that refers to a wayward shot that can’t be found; also, a term describing one’s set of clubs. The most common scoring format where all shots, including penalty shots, are used to total a player’s score. When a player chooses to use a putter from off the green instead of a chipping club. References the midpoint during an 18-hole round; usually occurring at or near the clubhouse where players can grab food and refreshments. A shot that comes off low and is not struck solidly. When a player has one chip or pitch and one putt; the chip or pitch is up, and the putt is down. A shot that rolls along the ground for some distance but never gets airborne. If you’re serious about golf, having a reference to basic terminology will go a long way. While you shouldn’t stress about learning each and every term, having an elementary understanding will make your experience more enjoyable all the way through, from checking in to the completion of your round. 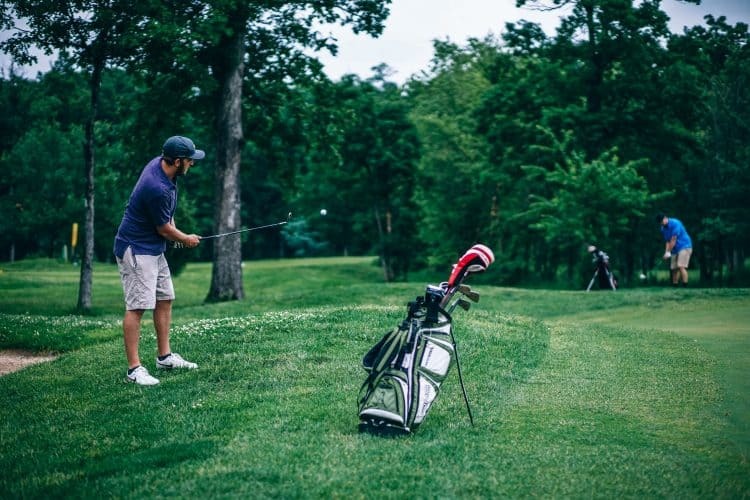 There are sure to be times when you get frustrated or intimidated, but always remember that golf is a game meant to be fun and most people are happy to help. 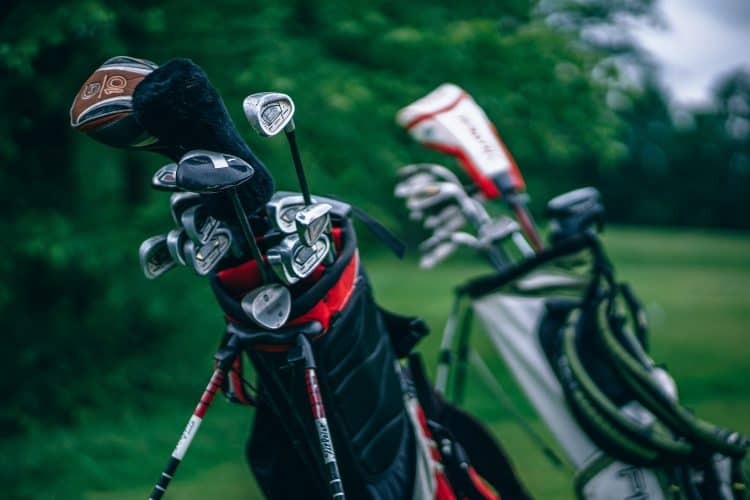 Check out our definitive guide of 93 of the most popular golf terms that every golfer should know when playing the game of golf.